The Commission on Presidential Debates (CPD), a non-profit organization established in 1987, organized the 1988, 1992, 1996, 2000 and 2004 debates. Previous debates were sponsored by the League of Women Voters (1976, 1980, and 1984) and the networks (1960). The CPD develops candidate selection criteria which are used to evaluate which candidates it will invite to participate. It proposes dates and locations of debates. It lines up corporate sponsors and oversees preparations for these important events.1 In Nov. 2007 the CPD proposed four 90-minute debates in the Fall of 2008. In an Aug. 2, 2008 letter Obama campaign manager David Plouffe accepted the CPD proposal. The Obama and McCain campaigns negotiated, Rep. Rahm Emanuel (D-IL) for Obama and Sen. Lindsey Graham (R-SC) for McCain, and on Aug. 21, 2008 issued a joint statement accepting four debates as outlined in the CPD proposal. (There was one difference--the original CPD proposal envisaged the first debate, at the University of Mississippi would be on domestic policy and the last debate at Hofstra University would be on foreign policy; the campaigns reversed it so the foreign policy debate would be first). On Sept. 21, 2008 the CPD announced the finalized formats, describing them as "historic." Each debate began at 9:00 p.m. EDT. Audience: 52.4 million viewers (36.2 million households). Audience: 63.2 million viewers (44.4 million households). 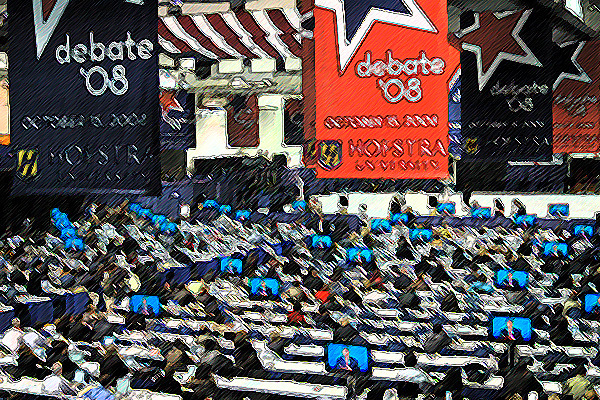 Despite the "historic" formats and the best efforts of the moderators, direct exchanges between the candidates were rare and the presidential debates remained somewhat stilted affairs. Major issues such as immigration were not addressed. The vice presidential debate, held on Oct. 2, 2008 garnered the largest audience of the four debates. New Orleans leaders, Google, and YouTube proposed a two-hour forum at Ernest N. Morial Convention Center in New Orleans on September 18: America's Presidential Debate in New Orleans. It wasn't a debate, but it did happen and it was instructive; Sen. Obama and Sen. McCain made back to back appearances and fielded the same questions at Pastor Rick Williams' forum on August 16 in Lake Forest, CA: Saddleback Civil Forum on National Leadership. A group of nonprofit organizations proposed the Fort Hood Presidential Town Hall focused on military and veterans to be held on August 11, 2008 in Belton, TX, but Sen. Obama declined. In June 2008 presumptive Republican nominee Sen. McCain proposed a series of weekly town hall meetings in advance of the national conventions but the presumptive Democratic nominee Sen. Obama declined: McCain Town Hall Meetings proposal. Third party candidates have raised strong objections to their exclusion from the debates. They argue that the 15 % threshhold is arbitrary and too high. In addition to legal actions,2 there have been unsuccessful attempts by a few members of Congress to legislate the question of participation. For example in Nov. 2001, Rep. Jesse Jackson Jr. (D-IL) introduced a resolution that sought to lower the threshhold for participation to 5 % (H.C.R. 263). In 2004, Open Debates, a 501(c)(3) nonprofit "committed to reforming the presidential debate process," established a Citizens Debate Commission in an effort to replace the CPD. The Citizens Debate Commission proposed five presidential debates and one vice presidential debate, what it termed "real and transparent" presidential debates as opposed to "stilted and deceptive events proposed by the bipartisan Commission on Presidential Debates (CPD)." (August 16, 2004 letter) Open Debates traces back to Ralph Nader's call for a People's Presidential Debate Commission (2/18/02). Founder George Farah has worked at Nader's Center for the Study of Responsive Law and authored a book, No Debate (Seven Stories Press, April 2004). Nothing came of the Open Debates proposal. Open Debates took several other actions. On Feb. 14, 2004 Open Debates filed a complaint with the FEC alleging "that presidential debates sponsored by the CPD are controlled by the major parties in violation of FEC debate regulations." The Open Debates complaint sought to have "the FEC prohibit the CPD from staging future corporate-sponsored presidential debates." And on April 2004 Open Debates filed a complaint with the IRS in an attempt to revoke the tax status of the Commission on Presidential Debates (CPD). Former House Speaker Newt Gingrich challenged the substantiveness of the CPD-sponsored debates. In an appearance in Des Moines, Iowa on Aug. 12, 2005 he called for an end to the current tightly formated presidential debates saying they "trivialize the whole process." Instead, Gingrich said, the candidates should engage in a straightforward dialogue without a moderator for 90 minutes. During a "Lincoln at Cooper Union" dialogue held on Feb. 28, 2007, Gingrich stated "I propose that we challenge every candidate in both parties to make a commitment before the nominating process begins that if they become the nominee they will agree from Labor Day to the election to nine 90 minute dialogues, one a week for nine weeks..."
There is no requirement that presidential candidates participate in debates, but it would be quite damaging to be seen as avoiding or blocking the debates, particularly since the candidates are taking federal funds. Typically every four years there is a ritual debate over debates. For several weeks the two major campaigns jockey back and forth haggling over details big and small--everything from the number and format of the debates to the podium height and shape and who is or is not acceptable as a moderator. Closed-doors meetings alternate with pointed public pronouncements, but eventually the two sides reach an accord. In 2008 the Obama and McCain campaigns reached an agreement quickly and without posturing. They did not, however, release the full Memorandum of Understanding [PDF] as happened in 2004. In 1988 media were criticized for giving too much attention to the spinners. Spin soundbites still form an integral part of coverage, but another common element is to assemble a group of undecided voters and interview them for their reactions. Starting in 1996, the Commission on Presidential Debates has run a Debate Watch program to encourage debate-watching groups around the country. According to the Commission in 2004 over the four debates more than 30,000 people participated in an estimated 2,003 groups around the country. These groups provided convenient opportunities for local media to do debate coverage. Several third party candidate debates occurred. An Alternative Presidential Candidates' Debate organized by the Coalition for October Debate Alternatives (CODA), the Nashville Peace Coalition, and Vanderbilt Students of Nonviolence, took place on Oct. 6, 2008 at Vanderbilt University in Nashville, TN; Frank McNulty (New American Independent Party), Brad Lyttle (U.S. Pacifist Party), Charles Jay (Boston Tea Party), Gloria LaRiva (Party for Socialism and Liberation), Darrell Castle (Constitution Party) and Brian Moore (Socialist Party) participated in the 2 1/2 hour event moderated by Bruce Barry, a professor at the Owen School of Management at Vanderbilt. An Independent/Third Party Presidential Debate organized by Free & Equal Elections occurred on Oct. 23, 2008 at Mayflower Renaissance Hotel in Washington, DC; however only Ralph Nader (Independent) and Chuck Baldwin (Constitution Party) participated in the forum moderated by Chris Hedges, the former New York Times reporter who is now a senior fellow at The Nation Institute. On Oct. 30, 2008 The City Club of Cleveland hosted a debate on "The Economy: Where do we go from here?" Ralph Nader (Independent), Robert Barr (Libertarian Party), and Chuck Baldwin (Constitution Party) participated in the event moderated by ideastream's Dan Moulthrop. (Cynthia McKinney (Green Party) was in Huntsville, TX protesting the death penalty and sought to participate by a remote connection to no avail). On Sept. 24, 2003 the CPD announced 2004 candidate selection criteria (the same three criteria as in 2000). 2. In the 2000 cycle, Pat Buchanan/Reform Party, Dr. Lenora Fulani's Committee for a Unified Independent Party, John Hagelin/Natural Law Party, and Ralph Nader all filed lawsuits seeking to gain entry into the debates, all to no avail (see the 2000 debates page). In the 2004 cycle there was likewise considerable legal activity. Third party candidates and parties filed an administrative complaint with the FEC on June 17, 2003 charging that the CPD is a partisan group and that therefore cannot finance the debates with corporate funds. This complaint would not be resolved until long after the debates and the election. After the FEC failed to act in a timely manner, attorneys filed suit in the U.S. District Court for the District of Columbia on Feb. 11, 2004. (press release). On Aug. 12, 2004 U.S. District Judge Henry H. Kennedy, Jr. ruled (Hagelin et al. v FEC) that the Federal Election Commission had to investigate the charge that the CPD is a partisan group. The FEC filed a motion to stay the decision pending appeal. The District Court granted this motion on Oct. 6. The matter then went to the U.S. Court of Appeals for the District of Columbia, which on June 10, 2005 issued a ruling siding with the FEC and reversing the District Court ruling. Attorneys for Hagelin et al. did not give up; they asked the Appeals Court to reconsider its decision, but on Aug. 9, 2005 the Court reissued its opinion, effectively ending the matter.